We have nearly 20 years of involvement with the Edinburgh International Festival and Festival Fringe and we work with a variety of clients many of whom turn to us every year for their needs during August. 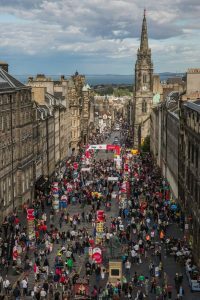 We are always interested in hearing from new owners with properties which are available during the Festival as well as producers, agents and performers etc who require a home-from-home during Edinburgh’s busy summer month. Please contact any of the team on 0131 550 3808 to discuss your individual needs.